While watching the marathon Chapel Hill regional game between UNC and FAU last night, more than a few plays stood out to me, but none more than this one. Top of the 13th, in a game that had gone back and forth since the 9th inning in quite dramatic fashion, with the go ahead run on 3B and 2 outs. 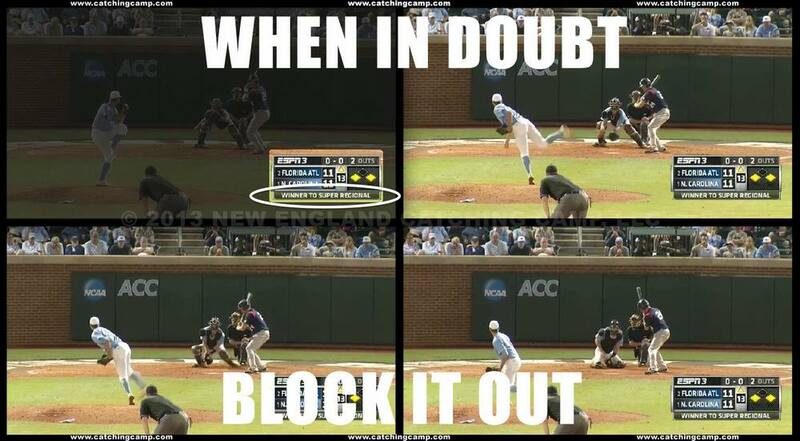 The UNC pitcher threw a slider near the dirt, but instead of hesitate and make sure that the ball was going to hit the ground, UNC's catcher fired the block immediately. Now having watched this pitch a few times, you can clearly see that ball never touches the ground and the catcher actually catches the ball in the air. Could he have reached out front and caught this pitch without firing the block? Most likely. But if he miscalculates this pitch by even a half inch, and the ball does hit the ground while he attempts to catch it, he may have just cost his team an opportunity to continue their run to Omaha. UNC's catcher did a fantastic job of recognizing that the pitch was close enough to the ground and off the plate that it would never be called a strike. He then fired the block immediately to ensure that on the off chance the ball does head into the dirt he would be waiting there with his body. Nobody was scoring on this pitch. Catcher's, if you aren't sure whether a pitch is heading to the ground, but it looks like it could, fire the block. If a pitch is close enough to make you think about blocking, it wasn't going to be called a strike in the first place. The worst thing that could happen is the ball doesn't go into the ground and either ends up in your glove or it hits you in the chest protector. Either result is significantly better than a runner scoring on a ball you should have kept in front.